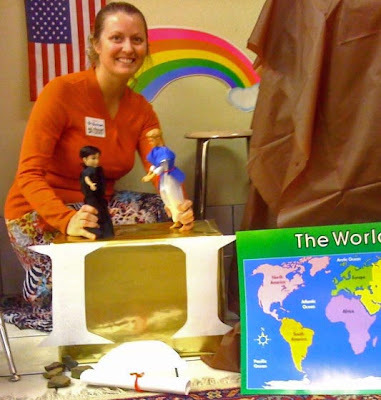 Working with the precious children in 5K Sunday school during the spring quarter was so much fun. Nina H. was my co-teacher, and Tim, who loves kids, assisted us. Nina was an absolute joy to work with. I was acquainted with her before this but did not know her well. Candy H. told me, "You are going to love Nina. Ya'll are kindred spirits." And so we are. Here is the balloon release we did on the last Sunday. We had talked about the Holy Ghost throughout the quarter and even had a wonderful move of the Spirit one Sunday, where the children were praying earnestly and one little girl came so close to receiving the Holy Ghost. She did receive it a few days later in church and was baptized in the lovely name of Jesus. Before the balloon release we talked to the children about how the balloons must have helium in them to go up and compared that to how we must have the Holy Ghost to go to Heaven. The picture below shows "Paul,", aka Tim, in chains, aboard the ship, along with the other "prisoners," "soldiers," and "sailors." Tim told the story. During the storm part of the story, Nina and I flashed the lights for lightning, turned on a sound machine with a rain sound and a high powered fan for the wind. The passengers rocked along with the ship in the stormy seas and were finally forced to throw their "suitcases" overboard. The ship crashed against the rocks, and Nina and I ripped apart the ship while the passengers "swam" and "floated" to safety. This was one of my favorite lessons. It was so realistic that a couple of the children looked scared. 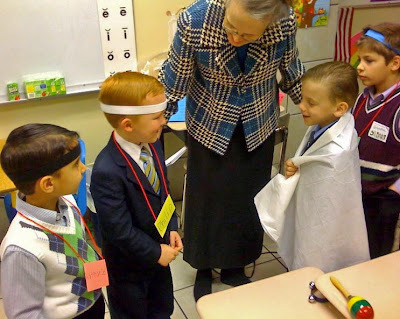 At the end, one little boy said, "Let's do that again!" Here's Nina with dolls representing the devil and Jesus. The Bratz doll with a goatee made a great devil. "Jesus" calls some of the "disciples." 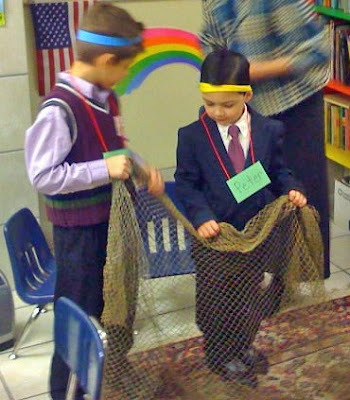 "Peter" and "Andrew" with their net. On Easter Sunday, we made Resurrection Cookies. I had made some at home the night before that I brought to eat after we made the batter in class and put them in the "oven." Here's one of our little dolls with her crown the Sunday we talked about heaven. Our church rotates teachers every quarter, so we won't be teaching this summer. But I will always remember this special group of five and six year olds. We made some happy memories. Sis. Z! Your class looks so fun and amazing! Please burn a CD of any pix that you may have of your Sunday School. I may be able to use them sometime. Thanks so much, Liz! I will be happy to burn a cd for you. We made LOTS of pictures. Thank you so much for your kind words. We made some great memories all those years ago, didn't we? I treasure those memories to this day. You were such a joy, so thirsty for knowledge and such a fun kid. I look forward to working with your darling Benson and Beatrice Caroline and making some new memories! I am so proud of the man you have become! Sis. 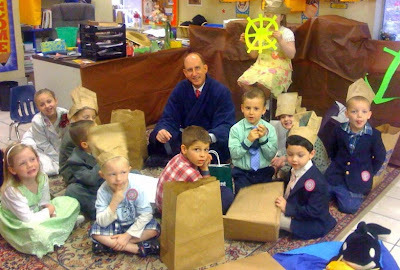 Zimmerman, Was so delighted to see the take on Samuel's Sunday school class. I love the balloon idea what a wonderful way for them to relate to what it will be like to be caught up when the rapture takes place. I am sure that they will always remember you and the special times you taught them. We love you so much. Sis. Cindy R.